The metatarsals are five long bones that lead up to the base of each toe. The fifth metatarsal is the prominent bone on the outside of the foot, and is unique when compared to the other four metatarsals for a number of reasons: it is the only metatarsal with extrinsic tendon attachments. The peroneus brevis and peroneus tertius tendons both attach to the base of the 5th metatarsal, and function to rotate the foot outward and help to prevent ankle sprains. Additionally, the base of the 5th metatarsal has very little skin and soft tissue coverage on the outside and bottom of the foot. This puts the bone at increased risk of fracture and delayed healing of fractures. 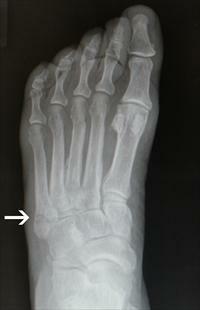 Dancer’s fractures, also called fifth metatarsal avulsion fractures, are the most common, representing 90-95% of all 5th metatarsal base fractures (Figure 1A). They occur when the ankle is rolled inward. The proposed mechanism of injury is that one of the peroneal tendons attaching to the base of the 5th metatarsal pulls off this part of the bone. However, evidence suggests that a ligament attaching to the nearby cuboid bone may be primarily responsible for the avulsion. Regardless of the actual cause, most of these fractures are stable and can be treated without surgery. However, they can take a number of months to heal completely. 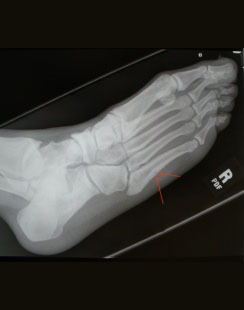 Jones’ fractures are fractures of the base of the 5th metatarsal, about a centimeter from the location of avulsion fractures (Figure 1B). Although they can occur with a severe inward sprain or an awkward step, they are usually caused be repeated stress to this location of the bone (i.e., “stress fracture”). Like other stress fractures, Jones’ fractures occur in a manner similar to the way that you would break a paper clip (by wiggling it back and forth over and over again, until it breaks with one force). They often occur after repetitive activities (e.g. sports). They tend to occur in people that have a high arched foot shape or a lower extremity alignment that tends to load the outside of the foot (e.g., being “bow legged”). Often Jones’ fractures can be treated without surgery. However, they have a tendency to recur because even after they have healed, the underlying reason why they occurred (weight-bearing tendencies of the foot) is still present. Therefore surgical treatment of a Jones’ fracture may be recommended, particularly in young, active people, in order to prevent recurrence of the fracture or non-healing of the fracture.